Petron launched its much-awaited Pagani Hypercar Collection that will definitely make any car enthusiast happy. 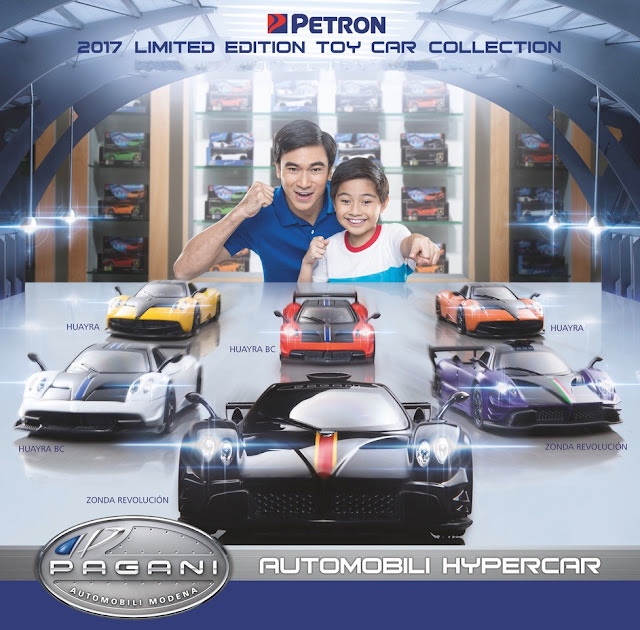 The Petron Pagani Automobili Hypercar Collection is a 1:32 die cast model, with push button doors so that it will swing open, and closing it makes the car accelerates. How cool! The hypercar cost P300 but you need to present a P500 or accumulated receipt of fuels (Petron Blaze 100 Euro 6, Petron XCS, Petron Xtra Advance, Petron Turbo Diesel, and Petron Diesel Max) as well as engine oils (Petron Ultron, Petron RevX, and Petron Sprint 4T) from any participating Petron stations nationwide. Promo runs from October 28 to November 11, 2017 only. The hypercar models include the Pagani Zonda Revolution which is considered as the most expensive and exclusive car in the world. Only five units of these car was built with a whooping tag price that exceeds P200M. This collectible comes in black and purple. Another special model is the Pagani Huayra which was named "Hypercar of the Year 2012" and was featured in the 2013 Transformers 4 movie. This car was a limited production of 100 units and cost over P100M. It was sold out by 2015. This collectible comes in yellow and orange. Then there's the Pagani Huayra BC, which was said to have only 20 units produced. This collectible comes in red and white. For car enthusiasts out there, you still have until November 11, 2017 to complete the Pagani Hypercar Collection.